Good language, simple to understand and straight forward training course! Concise and to the point. No wasted material. 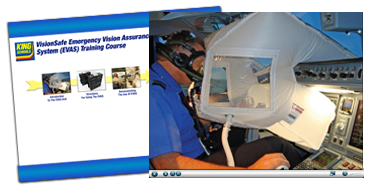 This course provides adequate information for the operation of the EVAS unit. Though an actual exercise using the unit in the sim is desireable, this training is much more affordable and adequate given the simplicity of using the unit and the low probability of actually having to use it. Course was good, covered the fundamentals. The course covered necessary information. EVAS would save the day! An amazing device should the flight deck fill with smoke. Very clear and simple training presentation for the device. Direct, to the point instruction of operational use. Guys, pls speak slowly, otherwise you unreadable. This is contradics with principle of Boeing documents writing- KISS. Quick and easy to understand. Explains precisely what is needed to operate an EVAS unit. Simple 3 part video highlights the EVAS system components and uses during a smoke event in the cockpit. Very easy to register and use. The course it self was clear and simple, going through operation and limitations step by step. They kept it very short but still covered all of the necessary items. It took lees than 15 minutes to complete. Great job! Short, concise and complete. Congratulations! Pleased with this online EVAS training hosted on King Schools' iLearn platform. 30 minutes, that's what it took to be familiar with the operation of the EVAS unit, its limitations and know its basic components.